The funeral Mass for Dominican Sister Veronica Lanham was celebrated Oct. 30 at Our Lady of the Rosary Chapel at Dominican Convent in Sparkill, N.Y. A native St. Louisan, Sister Lanham died Oct. 23 in Siena Hall at the convent. She was 97 years old, had been in the Sparkill Dominican community for 80 years and spent more than than 50 years in the ministry of education. Born Oct. 25, 1920, in St. Louis, she entered the Dominican Congregation of Our Lady of the Rosary in Sparkill on July 16, 1938, and received the name Sister Miriam. She professed first vows in 1940 and final vows in 1945. 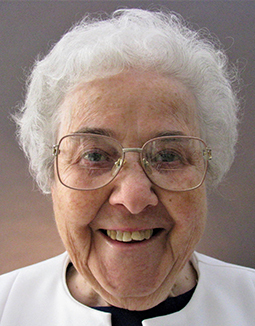 Sister Lanham earned a bachelor’s degree in history from Saint Louis University in 1949 and a master’s in home economics in 1956 from Columbia University in New York City. In the Archdiocese of St. Louis, she taught at Epiphany School (1941-49) and at St. Kevin School (1986-90). She continued to reside in St. Kevin’s Convent until 2001 when she came to Dominican Convent in Sparkill. Sister Lanham served in the Diocese of Brooklyn at St. Teresa School in Woodside, N.Y. (1940-41) and the Archdiocese of New York at St. Martin of Tours School (1949-55), St. John Chrysostom School (1955-56), Aquinas High School (1956-67) and Msgr. Scanlan High School N.Y. (1967-78; 1983-86) — all in the Bronx. Sister Veronica also spent four years (1978-82) as the manager at Thorpe Senior Center in Sparkill. Sister Veronica is survived by a brother-in-law, Robert Vierling.